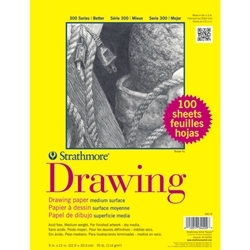 Strathmore Drawing Paper Classroom Value Pack - Series 300 - 9"x12"
Home / Paper → Drawing and Sketch → Strathmore Drawing Paper Classroom Value Pack - Series 300 - 9"x12"
An economical, 70 lb. white, acid-free drawing paper with a regular surface. It is ideal for crayon, pencil, pen and ink, charcoal, watercolor or felt markers. 100 sheets per pack.